At Clayton Creek, the run starts off with a major class IV/IV+ rapid, followed by a few miles of continuous class III/IV whitewater. From there the gradient gradually eases up, turning into class II swiftwater. The upper section contains significant amounts of wood that could pose a serious hazard in the event of a swim or blown line. Most of the run can be easily scouted from the road, but there are a few blind spots. Put in an take out where you'd like between Kelly Forks and Clayon Creek to customize your run. The farther up you go, the more difficult it gets. Kelly Creek is a good option to tack on to Black Canyon or Cayuse Creek. The popular Irish Railroad section of the North Fork of the Clearwater is 25 miles downstream from Kelly Forks. There is developed camping at Kelly Forks, and up Black Canyon at Hidden Creek. Camping above Kelly Forks is sparse, though there are some undeveloped spots upriver at Moose Creek. Kelly Creek is an extremely popular fishing destination, and things fill up later in the season as flows drop. If you're coming from the North, access is from Superior, Montana via Hoodoo Pass on road 250. Exit I-90 at Superior, take the frontage road East on the South side of I-90 and stay on it. Hoodoo usually opens around the first week of July, which generally corresponds with nice mellow flows on Kelly Creek and Black Canyon. 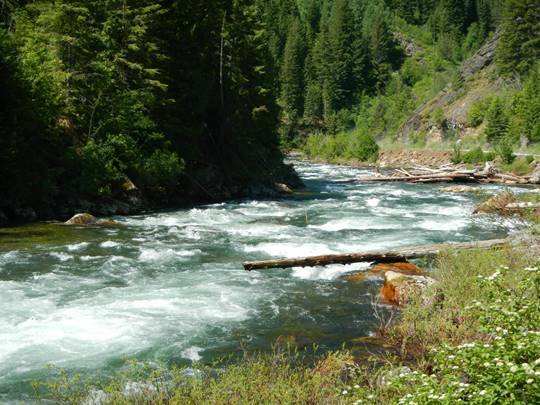 From the South, it is a long trek to Kelly Creek via the towns of Orofino and Pierce. Boaters in North Idaho tend to think of the North Fork of the Clearwater drainage a little differently than boaters from Southern and Central Idaho. Our season starts when Hoodoo Pass opens (from Superior, Montana), which usually isn't until around the first week of July, depending on snow pack. With Hoodoo open, the North Fork and its upper tribs are doable as day trips, as opposed to making the long and arduous drive into the basin from the bottom, via Orofino and Pierce (an additional 250 miles of driving). While peak run off is usually over by the time Hoodoo Pass opens, runs like Black Canyon, Kelly Creek and Cayuse Creek are still at fun, medium levels. For a weekend trip, it is feasible to tack on the Irish Railroad section, and Skull Creek and Weitas Creeks are usually still at runnable levels then too. The North Fork basin is a welcome extension to our local season. The nearest online gage is on the North Fork of the Clearwater near Canyon Ranger Station, more than 40 Miles downstream, below several major tributaries. Approximate minimum flow (very approximate) is around 3,000 CFS. In 2013 we ran Kelly Creek at 4,500 cfs and again at 4,100 cfs. These were medium-low flows with fun, but challenging rapids. The difficulty of the run increases significantly at higher flows.